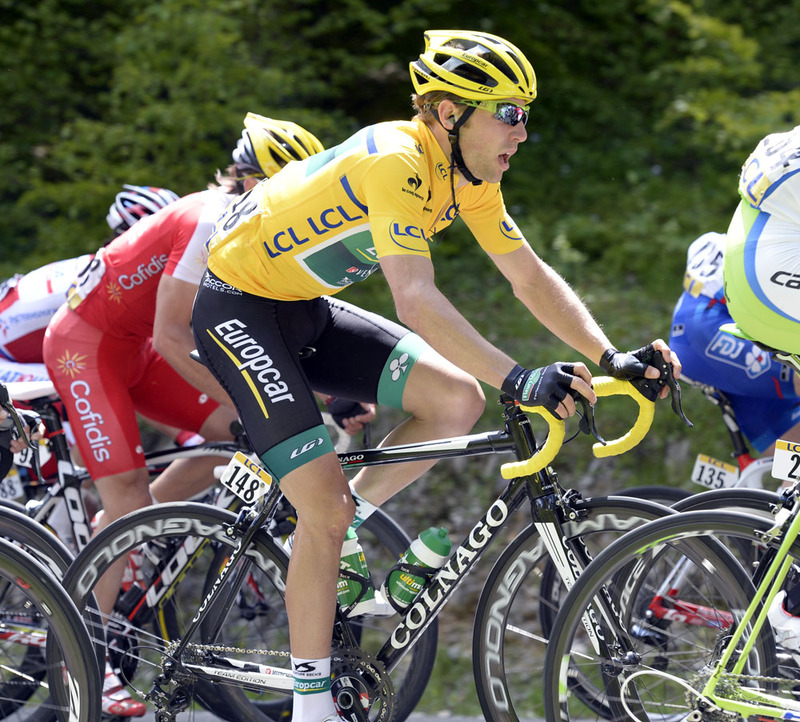 Elia Viviani (Cannondale) won the bunch sprint at the end of stage two of the 2013 Critérium du Dauphiné on Monday. Viviani sped past Gianni Meersman (Omega Pharma-QuickStep) to take the victory, with Tony Gallopin (RadioShack-Leopard) claiming third. Canadian David Veilleux (Europcar) maintains the overall race lead after taking a solo win on the opening stage on Sunday. Meersman is second at one minute and 56 seconds, with Gallopin moving up to third overall, one second further back. British hope Chris Froome (Sky) once again stayed near the front of the peloton to keep out of trouble, and is seventh overall at the same time as Gallopin. Geraint Thomas (Sky) is now 10th overall, also at the same time. Three riders escaped after 20km of racing: Thomas Damuseau (Argos-Shimano), Rudy Molard (Cofidis) and Arnaud Gérard (Bretagne-Seche Environnement). They were later joined by José Mendes (NetApp-Endura) after he bridged across from the peloton to form a quartet. Damuseau had been in the escape group during the previous day’s stage, and was aiming to vacuum up as many mountains points as he could. Stage two featured six categorised climbs, offering plenty of opportunity for the Argos man to amass KoM points and put himself into the mountains jersey. Omega Pharma-QuickStep led the peloton to hunt down the break, and the final rider – Molard – was mopped up before the day’s last climb, Col du Sentier, with 20km to go. Rein Taaramae (Cofidis) then chose his moment to attack before the summit and managed to get a gap. Cannondale and Sky joined Omega Pharma-QuickStep at the head of what was left of the peloton to catch Taaramae on the descent. The pace was kept high into Oyonnax, and Cannondale kept Viviani out of trouble up near the front around a tight right-hand bend. Meersman opened up his sprint early, closely followed by Viviani, who accelerated past the Belgian in the final 100 metres to take a convincing victory. Some struggled with the day’s up and down route, with Jelle Vandendert (Lotto-Belisol) withdrawing from the race and several riders getting distanced by the peloton, including Andrew Talansky (Garmin-Sharp), Lieuwe Westra (Vacansoleil-DCM), Simon Gerrans (Orica-GreenEdge) and Thor Hushovd (BMC Racing). Tuesday’s stage three offers up more of the same, with two third-category hills in the second half of the stage and a fast 10-kilometre descent to the line in Tarare.